Our Gourmet Greetings contains some of our most popular gourmet foods, all wrapped up in a stylish container. Each gift is made with detail and is topped with a hand-made bow. 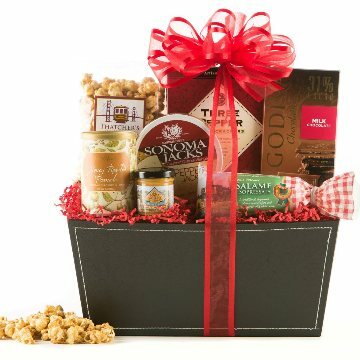 This gift basket includes the following: Ghirardelli chocolate, honey roasted peanuts, San Francisco-made caramel popcorn, and more!